The Dream Game Theory -or- What is a Catch 22? Below are two dreams that speak about having to make choices. The first dream is about making a choice of calling your mother or your boyfriend. The second is about how we choose to face inevitable death. Everyone in their lifetime will have to make difficult choices, some of the problems we face in life we have little control over. There is an evolutionary advantage to nature having built in the dream into our psychological make up. The dream allows us to run "as if" simulations, and watch how we can solve problems and survive. I remember, as a student I had a professor who was the department head of the "Biomathematical Institute", towards the end of a class, he asked the students a question; "What is a Catch 22?" Having read Joseph Heller's book "Catch 22" and understanding Gregory Bateson's concept of a "double bind", I answered his query, however the professor still didn't understand. So I simplified things conceptually, and said I could illustrate the psychological concept by playing a game with a coin. He brought out a coin and I said that he would have to flip it, but not before I made one rule to the game. He agreed...the rule is; "heads I win, tails you loose". The class of about 150 students broke out into laughter, and no sooner had I said the rule, and students were laughing, the bell that signaled the end of the class rang, creating even more laughter. 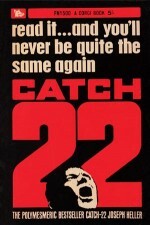 The insane and vicious circular logic of Catch 22 is inescapable. Game theory has always been a topic of interest for me, especially as it applies to dreams and dreaming. Hans Vaihinger's "The Philosophy of ‘As If'" can be applied to what the dreaming mind by suspending disbelief does every night. From a popular culture perspective, anyone who is a Star Trek fan will know the Kobayashi Maru test which illustrates such a no-win situation. Kirk is asked; "Then you never faced that situation...faced death." Kirk replies, "I don't believe in the no-win scenario." 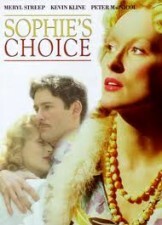 From a different film perspective, "Sophie's Choice" illustrates a painful choice and a memory that haunts a person for her whole life. Meryl Streep (Sophie) won an Oscar for her compelling performance. I have just survived a plane crash. All the crew and the tour organizers have been killed. Two of my friends have also survived, as well as a number of other passengers. We are in Greece. I have only the clothes on my back - a tiny pair of denim shorts and a flesh-coloured vest. Finding the toilet part of the plane wreckage intact, I venture to look in the mirror, perhaps for evidence of wounds, but all I see is that the sun has already begun to bleach my hair a lighter shade of brown. This surprises me, as my hair is very dark, and I wonder for a moment just how long I have been unconscious on this beach. My cellphone battery is low and I am distraught because in the choice between calling my mother or my boyfriend, I must choose her. When I speak to her, I try to emphasize that I am fine, and that we can easily survive because all the bottles of water from the plane got thrown out when it crashed and embedded themselves in the sand. But she dismisses all my words, saying that she knew it had happened because it had happened before. This frustrates me - I am still not used to her psychic ramblings - so I hang up, and join my two friends. In the dream Brigitte evidently sees only herself and her appearance, more concerned about looking in a mirror and looking at her hair, than asking herself if everyone is really dead. Given the choice to call her boy-friend or her mother, she chooses her mother. I guess as the cultural idiom points out; "blood is thicker than water". I lived somewhere that a volcano was about to erupt, there was no way to escape. Somehow, I knew that the biggest danger was lava flowing. I had a small amount of time to prepare, so I set barriers in front of my house to try to divert the flow around me. I also made a plan to raise my house up into the air several feet so that if the lava did get around my barriers that it would flow under the house. There was chaos all around as the lava started flowing. People everywhere were just jumping into the lava because it was better then burning slowly in the fires that consumed their homes. The feeling reminded me of how I felt on 9-11 when I saw people jumping off the World Trade Center because it was better then burning inside it. When the people jumped into the lava, they went feet first and I could tell that for the few seconds before they were dead that they were in excruciating pain as their bodies incinerated from the feet up. It was terrible to see. My barriers were not working and lava was flowing under the house. The back part of the house blew up in flames but the front part still provided shelter. But as time passed and people became more desperate, some decided to dive into the lava head first thinking it would be a faster death then feet first, but I could tell that it was unbelievably painful as the lava burned their faces off before they died. They would scream horribly as they went in. Then I noticed that the floor of the house was starting to get VERY hot. I knew my shelter would soon be gone and that I soon must choose how I would die...feet first or head first...and I didn't like either way, then I remembered that I had a gun in the house and I decided that I would shoot myself in the head because it would be a lot less painful. I was sitting there with the floor scorching my feet with the gun to my head thinking of what a terrible choice this was and that I didn't want to die. Then I woke up. This dream was very upsetting. The emotions I felt while watching the people die were extremely intense. The fear and panic as the floor began heating up were palpable. And there was also a terrible acceptance of a bitter, yet still almost unbelievable, ending to my life. Reminding us one more time about 9/11, the second dream really illustrates the agony of the no-win situation. Facing sure death, what would you do? The topic of "The Falling Man" is also discussed in the dream interpretation "Remembering the World Trade Centre".